We’ve all seen the sales figures for the iPhone — hundreds of millions of devices selling with shocking regularity, leading to a total sales number north of one billion phones since its debut in 2007 — but the figures are so gaudy it’s hard to even put it in perspective. A new report from the Wall Street Journal does a pretty stellar job of this by showing how the iPhone not only compares with other now iconic products from the Barbie doll to the Sony PlayStation, but also how Apple itself has evolved since the iPhone’s launch. 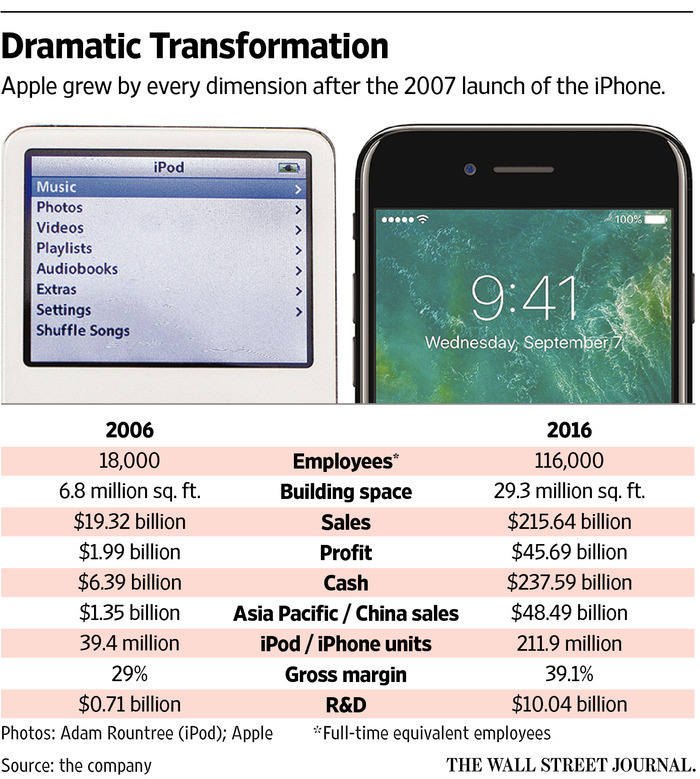 The whole article is worth a read, but the most stunning point is definitely the head-to-head comparison between Apple as it existed in 2006 vs 2016. Comparing everything from total full-time employee headcount to the amount of money the company invests in R&D, the numbers are so shockingly different that it’s hard to believe it’s the same company. Employee growth of nearly 100,000, profit growth of roughly 2,500%, and a cash hoard that has grown over $231 billion in just ten years are seriously impressive no matter what way you look at it, and those numbers continue to grow every year. Of course, it would be easy to argue that the iPhone isn’t the only reason for Apple’s growing dominance, especially with steadily growing Mac adoption, Apple’s foray into wearables, and of course the iPad’s boom, but it’s hard to imagine any of those things taking place in a world where the iPhone doesn’t exist. The iPhone made Apple fans out of people that previously had no reason to care about the company’s products, and raised the tide that brought all of its sister boats with it.